Deep down, I think we know why we share stories about people who are or have been important to us. It’s not to recount an experience that comes to mind from a trigger word in a conversation. It’s not just dates — birthdays, holidays, anniversaries — or smells or sights. But deep down, I think we tell and re-tell stories about people we feel are worth remembering. 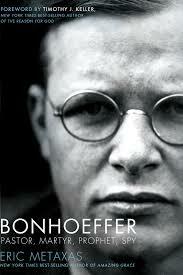 This weekend I finally finished a biography on Dietrich Bonhoeffer. It took me exactly 18 months to read, digest, and define words I underlined and understand the context of the writing. I knew his fate: martyrdom for the faith just before the Allies rescued Germany. I knew the ending, but Eric Metaxas took me a beautifully insightful and informative route to get there. If you’re into biographies, I highly recommend Bonhoeffer: Pastor, Martyr, Prophet, Spy A Righteous Gentile vs. the Third Reich (2010). This weekend is also the time our country formally observes and thanks mothers. I thought about the main lesson for me when I closed the book about Bonhoeffer and how it compares to my Mama. For some of you this may be a weird connection, especially if you know little about Bonhoeffer. But to other “beautiful minds” like mine, this will make sense. The bottom line, the moral of the story, the point of this blog is LOVE. Mama’s life I learn more about how much God loves me. Mama is not a complex person, yet I find it difficult to define her in simple words. Human relationships go through seasons and have a many-sided grace that cannot be boxed in or simplified just for our understanding. I like that about Mama — that it’s impossible to dumb her down just to paint a picture for you. She is what the bible calls a “liberal soul” in Proverbs 11:25, and she is gifted, wise, and considerate to a fault. She’s a manager, a leader, a trail blazer, an insightful and courageous lady. She came of age in the Jim Crow south…a direct communicator, the fourth of five girls, and a stickler for order. She is a dreamer, and in her 70s can still surprise me with the dreams she keeps close to complete. It is with great thanks that I honor my mother today, and most days (just being honest; some days I revert to thinking she doesn’t understand….then have to come back and tell her she was right again! ), and offer this tribute. It is with an overwhelming sense of awe that I thank the Lord for using Bonhoeffer’s story to remind me that God knew what He was doing when He put me in my family…that perfection is for the birds, and the differences in the family strengthen us for the world outside. Bonhoeffer’s story reminds me of Mama — she won’t be here forever (as she often reminds me), yet I realize more and more the impact of her contributions to this world. I mention her as a Mother’s Day tribute, yes, but also because she is a person worth knowing. It’s a shame, isn’t it, that we can miss out on getting to know some valuable people because they live by a standard we do not understand? Mama (and Bonhoeffer) express a loyalty to God and a commitment to Scripture and its life application that provoke the censure of many. Some time ago, I took to reading biographies because there were so few with whom I could identify in my era. We hear the eagle metaphor preached in church — that they fly alone, that other “birds” cannot live at the flying altitude of an eagle, that “eagle people” are charged to be great and complete much of their task in isolation. The seasons are less and less in my life where I require or even care about your (that is the general public’s) opinion about God’s standard for me. For years, I looked everywhere — for pastors to cure the loneliness, for friends and sisters to understand fellowship, for mentors to teach me how to have thick skin, for an audience to deposit all this greatness…. The majority of the time the search took me back to Mama — my most faithful date, my laughing and eating out buddy, my cheerleader and constructive critic, my public relations department…the real ride or die chick! Thank you Father, for the reminder through Bonhoeffer’s story and life that brings me to another Mother’s Day with a chance to see Mama with fresh eyes (again!). You love me! Selah, love to all, and Happy Mother’s Day!